Airport Animal Hospital has been trusted by Toledo's fur families for nearly 50 years. We are a busy veterinary hospital, continuously serving Toledo's pets at the same location at the corner of Airport and Byrne since 1972. Dr. Cuesta and his Veterinary Nursing professionals are grateful for this honor. A friendly, furry, and heartfelt thanks goes out to our wonderful clients for their support through the years. 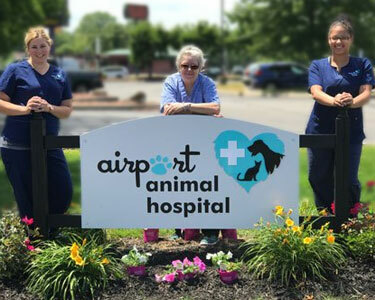 Thank you for making Airport Animal Hospital your Toledo veterinarianl! Choosing the right veterinarian for your furry friend is very important. We aim to earn your respect, so we don't ask for reviews or pay for likes. Our web reviews are authentic, unfiltered, and trustworthy. Please click on the links below to find out why so many fur families choose Airport Animal Hospital. Every hour of every day, Dr. Cuesta, his family, and his team of dedicated professionals pledge to devote our personal efforts to maintaining our reputation for insightful, personalized and compassionate pet care. Our old Max is on the mend. He is 14 and still going .. Thank-you Dr. Cuesta for giving him great care !! Fantastic service from the staff and Dr. Cuesta. Would highly recommend.